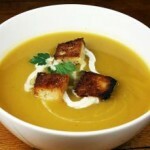 Butternut Squash Soup is an Autumn themed divine recipe with curry. In large saucepan, over medium-high heat, cook carrots, onion and garlic in oil until tender, about 5 minutes. Add ginger, curry, cinnamon and nutmeg; cook for 1 minute. Add squash and apple juice. Heat to a boil. Cover; reduce heat. Simmer for 15 minutes or until squash is tender. 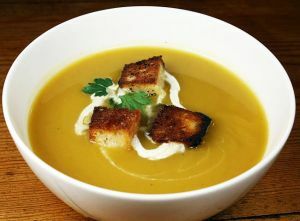 In blender or food processor, puree soup, in batches, until smooth. Return to saucepan; heat through.